We’re more than a third of the way into the season and that’s enough to get some kind of sample size or barometer on what we can expect from the Royals in the coming months. They’ve been all over the map in the first fifty or so games. They’ve been hot at times and they’ve gone through frigid streaks as well. Injuries have taken a toll, but using that as an excuse simply won’t fly. For the most part, the backups brought in by Dayton Moore have filled in nicely. Whit Merrifield, Cheslor Cuthbert, Drew Butera and Brett Eibner carried the team in several games during their recent winning streak. Cuthbert had to leave the game Monday night in Baltimore with an injury. The Royals had a disastrous series in Cleveland and were swept because of some shoddy fielding and too many silent bats. That 8 game stretch where the Royals scored 58 runs was encouraging but it must be pointed out that five of those eight games were against last place teams. The 2016 Royals have now hit another dry spell with the lumber. Suddenly, they are having problems scoring again. They’re 13th in the league in that category. They ended a 17-inning scoring drought Monday night, but their lone run was unearned. The other issue the Royals are having is the starting pitching. It’s been suspect since opening day. Chris Young has been dreadful. The Royals need to end the experiment with this 37-year-old washed up pitcher. Hopefully, Danny Duffy has reached a point in his career where he can start being productive. A starting job in the rotation is up for grabs. The bullpen and defense have kept the Royals afloat this season. They don’t ask much from their rotation. The Royals need only 15 outs a game or 5 innings. The bullpen then takes the torch to the finish line. I’m still not sure where Soria fits in. It’s just not the same the second time around in KC with this relief pitcher. It was about this time a year ago when the Royals caught fire, grabbed the bull by the horn and ran away with the Central Division. They were never out of first place after June 9th. The Royals are trying to defend their World Championship without much help from a quartet of regulars. Kendrys Morales, after driving in 100 runs last year, has provided basically nothing as the designed hitter. Omar Infanti’s arm is shot. He has a hard time turning a double play much less attempting to throw out runners on ground balls to the right side. Alex Gordon can’t stay healthy and Moose has missed more than half the games this season because of various injuries. With all the bad things that have happened this season, the Royals are still finding a way to be very much a part of this race. If Morales can start producing with the bat and Moose and Gordon can stay healthy when they return, the Royals will be very much a part of the party in October. But somehow, someway, they have to find a way to score. The Royals have now lost 5 straight on the road trip after falling 4 – 1 in Baltimore. The Royals have been outscored 29 – 7 on this road trip. Tickets For Less is an Overland Park, Kans.-based ticket seller. 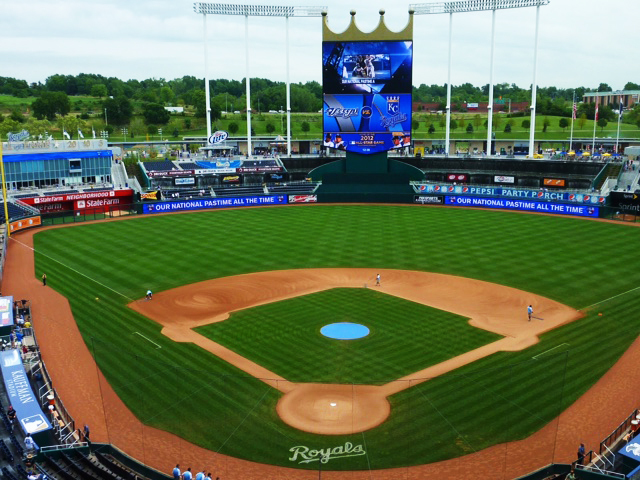 We are one of the biggest sellers in the country for Kansas City Royals, Kansas City Chiefs, Kansas Speedway and Sprint Center. To order from Tickets For Less, call 913-685-3322 or visit our website.